There was a major crisis in July 2014, when Tamboran Resources announced its plans to drill a deep borehole in a quarry in Belcoo, County Fermanagh, and moved men and machinery on site. GEAI supported the protest in several ways. Members gave presentations to many groups who were not familiar with the problems associated with fracking; they also assisted in drafting flyers, posters and campaign material. 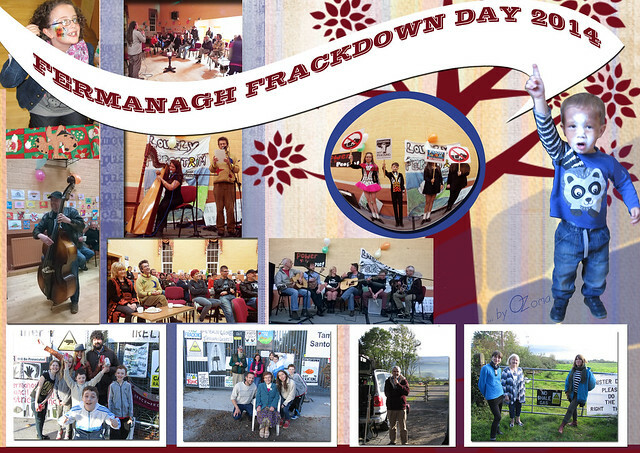 GEAI was very active on Global Frackdown Day in Fermanagh, supporting events throughout the day and producing publicity material. In September, Leitrim County Council had to amend the policy statement concerning the ban on fracking in the draft Development Plan. GEAI members were very involved in the drafting of the new policy statement. Alternative wording affirmed the ban and was accepted unanimously. Presentations given to Ballinlea Residents, Antrim; Several groups in Fermanagh, European Anglers Alliance, Cork. Participated in webinar on Climate Change organised by Mercy International; discussion session with Fr Sean McDonough, a member of the IPCC Climate Committee. Participated in Health Impact Assessment seminar in May, together with Love Leitrim and FFAN. Paper arising from Seminar. 22nd September 2014 was Global Frackdown day. Many events were organised throughout Ireland to mark this day. GEAI was very involved with the Fermanagh Frackdown Day, which included a demonstration outside the Belcoo camp and gates and participation in the Frackdown Day event in Mullaghdun Community Centre, Fermanagh. Love Leitrim organised a gathering in the Marketplace, Manorhamilton, County Leitrim. Many anti-fracking groups attended the event including GEAI.